Audible signal for coolant overheating? Has anyone ever rigged up an audible signal or alarm for excessively high coolant temperatures on the LT1 engines in Caprice wagons? Any suggestions on how this might be done? I'd prefer some early warning of coolant loss/cooling failure to attract the attention of the driver other than rivulets of water and steam creeping across the hood towards the windshield. The coolant system operates at about 12 psi. 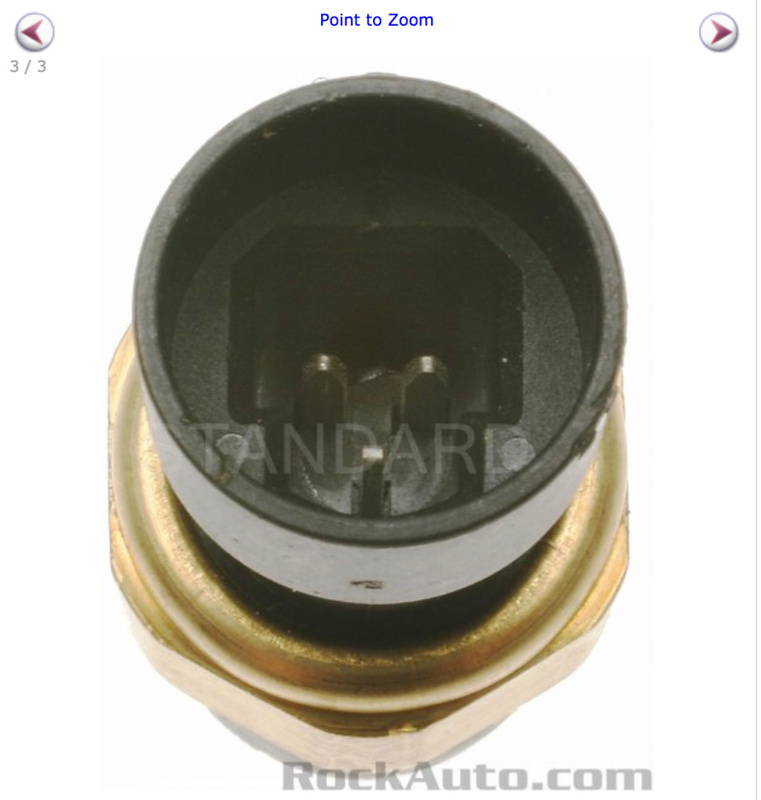 You could rig a pressure sensor, and if the pressure in the coolant system decreases, it has a leak. Use an adjustable fanstat to ground a relay that powers your choice of 12 v noise maker,. Maybe a nice fiamm mounted under the dash. This would help when overheating was due to rapid loss of coolant, but overheating could occur due to other causes and persist long enough to cause damage before pressure in the system fell. I've had an electric water pump conk out on winding back road, and if I had not glanced at the temperature gauge at the moment it happened, I'd have possibly replaced an engine rather than just a pump. It would seem that with multiple causes for overheating, imminent overheating would be the best trigger for an audible alarm. Is there a way to program this into the PCM based on the data stream from one of the coolant temperature sensors? Something similar to what is used to trigger the relay for the secondary cooling fan, for example. I like the adjustable fanstat idea. The underdash Fiamm horn might also help with constipation. If you tapped into the activating ground for the chime module, and used an adjustable temp sensor, you could mimic the other sensors, and trigger the chime module. Looks like I have a number of options for an adjustable fan thermostat. The sensor inserts of many are 3/8" NPT. Is there a port or freeze plug available on the LT1 that would be readily accessible for a sensor of this type. The bleeder port near the water pump, perhaps? What about adding a metal T to the bypass hose with the proper 3/8" female port? There are other options where the sensor is inserted (jammed?) in between the cooling fins of the radiator. That seems a less desirable option for a car that could be driven in weather ranging from 0 to 100 F, and might not detect a failure of the water pump or thermostat, as coolant flow through the radiator would stop. 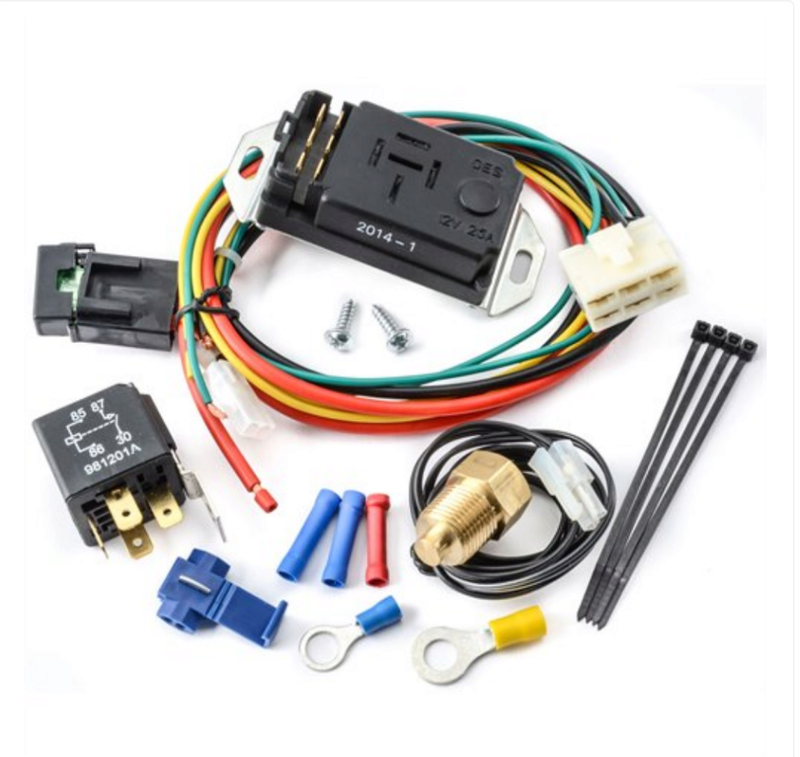 The third type of sensor I found is designed to be immersed in the coolant, but it's not immediately apparent where this could be incorporated in the system where a coolant loss would not result in false readings. Ideally, I'd like the sensor near the pump or the cylinder head to pick up overheating, function as an early warning system, and set up a ruckus before I cook the head. I want to avoid that OH SH*T moment, when you glance down at the instrument panel and notice that the temp gauge is quietly indicating that your engine is toast. 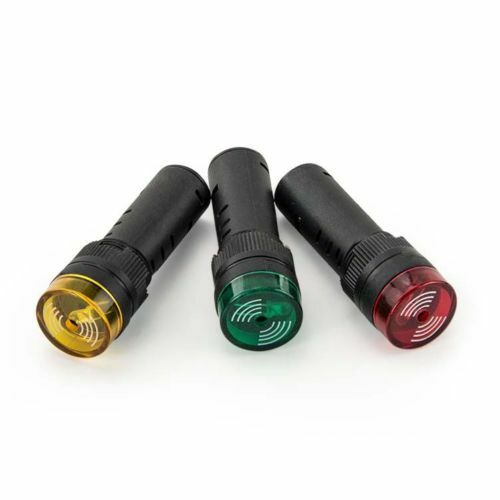 JEGS or Summit have a sensor with a long probe that can be inserted between a hose and fitting, then clamped down with the hose. I had no problem with any leaking where it was inserted. I used one on my 91 when I had the dual FW cooling fans on it. It would turn the fans on at a certain temp (I forget what that was, and turn them off if it was below that. They are only around $30. I only needed about 8 inches of the probe, so I coiled the rest along side of the control box. I put it in the upper hose, and in your case that would be where the temp reading should be used, so that some leakage would remove the sensor from the coolant if it got low. I still think a pressure sensitive probe would be best, because the lack of correct pressure in the system when hot would indicate a leak. You can insert a T anywhere to obtain a temp reading. I would only place it in a hose that is constantly being used. Choose something that will thread into the original cylinder head temperature sensor boss. That link seems to be dead. It works for me. Try copying the link and pasting it directly to your web browser. Ok, I figured it out. There's a problem with their IPv6 routing. They have a valid IPv6 address and the server responds to pings, but it fails to serve content. If I disable IPv6 in my browser so it reverts to IPv4 then the link works. Most people in North America are still stuck using IPv4, so the admin may not be aware of the problem. I sent them an e-mail to alert them to the issue, but if others have the same problem then just temporarily disable IPv6 access. It was an interesting article. My only concern would be whether or not the newer 3-wire sender has the identical temperature/resistance curve as the original one wire sender. If it does not, then the PCM would be acting on erroneous input, at least, at some point on the curve. The author does not mention if that was investigated or not. My needs are relatively simple and specific. Dead nuts accuracy of coolant temperature indications from all sensors is not my objective. On my car (1996 Caprice), the gauge temperature and PCM input temperature is very stable once the engine reaches operating temperature. This stability breeds complacency that creates a risk for me. I want to eliminate my part in that risk. All I really need is a good squawk to draw my attention to the dash gauge as soon as it starts a sweep to the right. Pressure triggering of an alarm would seem to require underpressure and overpressure sensor monitoring to allow warm up without triggering an alarm. This would provide the needed warning of imminent overheating indicated by overpressure. But then how does the system trigger an alert once the engine reaches normal operating range and a rapid pressure loss occurs due to a rupture in the system? 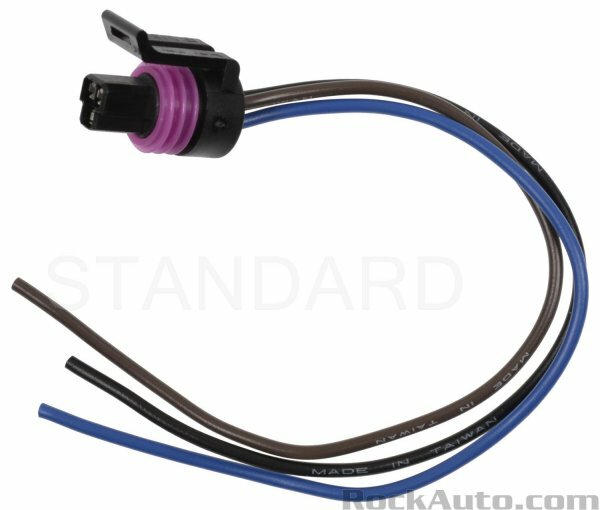 On nearly every vehicle where I have experienced more than marginally above-normal engine temperatures since I started driving in 1970, it was due to a complete and rapid failure of a hose, a fitting, or a plastic component of the radiator fractured; i.e, a complete and rapid coolant loss. The only exception in my case was the seizure of an electric water pump on a Roadmaster wagon. Chronic high temperature is not the issue here. The present dash gauge set up would warn of that. 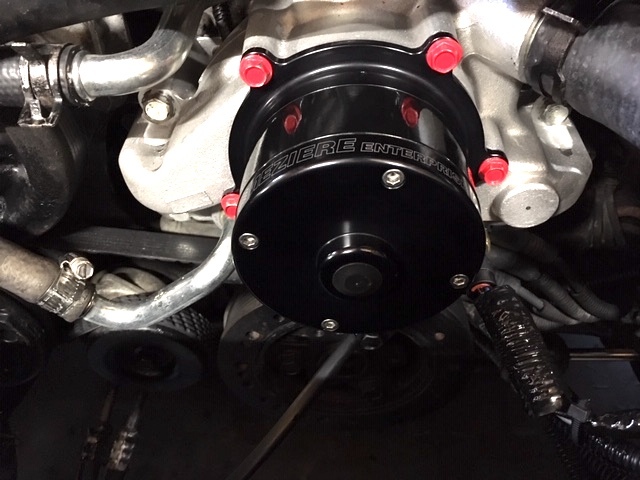 There are a number of tweaks that could be made to the LT1 cooling system and sensors thereof, but my objective is comparatively straightforward: catch my attention immediately using noise as soon as the coolant temperature moves outside of it's normally stable temperature. With great appreciation for all advice received, here's what I think I'd like to try first: an adjustable fan-stat in the unused port of the passenger-side cylinder head, coupled to one of the LED buzzers suggested above. I can set this by trial and error to remain silent within the normal operating range. If there is a rapid loss of coolant, the temperature of the coolant remaining in the head, or the temperature of the head itself, will spike rapidly and immediately trigger the alarm. Anyone see any holes in the logic here? That's exactly what I would do, if that helps any. And a mere 16 months later, it's DONE! Thank you JaySS for walking me through the wire codes to make this work. Here's what was done. The mechanical fan was replaced with dual electric fans, and the standard mechanical fan was replaced by a Meziere electric pump. The standard gauge or warning light does not reliably provide an audible warning if the engine is overheating. If you're like me and watch the road rather than stare at the gauges, you'll need a "hey, look here" signal if you are going to avoid a steam eruption as your first sign of a problem. To provide some audible warning, I swapped the temperature sensor in the water pump housing with the dual sensor/sending unit used in the 1996 Corvette. This is a 3-wire unit (2 of these wires are connected to the leads that ran between the PCM and the old sensor. The 3rd wire is allowed me swap the gauge sending unit in the passenger side head with a sensor for an adjustable fanstat in the vacated port in the cylinder head. The fansat was connected to a LED/buzzer under the dash that would flash and buzz if the engine temp wnet significantly above normal. Because it's adjustable, I can set the warning as sensitive as I like. I just clipped the wire off the old gauge sending unit and rerouted it the new 3-wire unit on the water pump housing, and now the unit supplies both the temp reading to the PCM, and operates the gauge and idiot light in the dash. 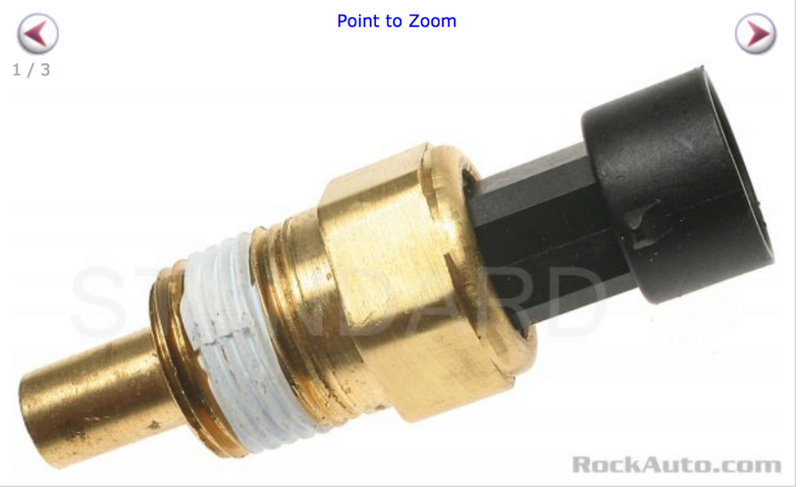 The Corvette sensor and connector are available from Rock Auto. Everything is hooked up and working. Confirmed through the readouts on the climate control display that the gauge was operating normally, and that primary and secondary fans turned on and cut out as the correct temperatures. The only bad part was tightening the the sending unit for the adjustable fan stat from under the car (no lift). You'll need a 13/16th box wrench and a lot of patience, as access is limited and you only get about 15 degrees of rotation each time. Almost forgot. Here's the LED/buzzer I used. They come in 3-packs. 16 mm (about 5/8") diameter. Loud enough that you'll notice, not so loud that you'll need a change of underwear. Subject: Re: Audible signal for coolant overheating?